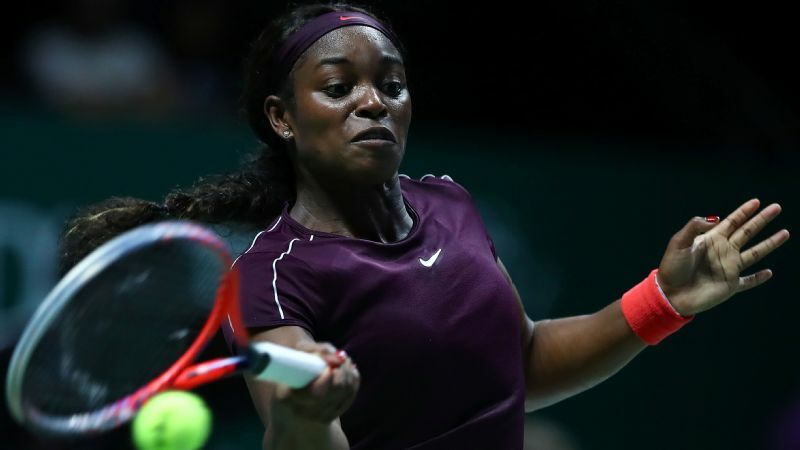 Sloane Stephens beat Kiki Bertens in three sets at the WTA Finals in Singapore to keep the Red Group wide open until the last day of round-robin play. There's been an extra bit of energy in Sloane Stephens' first step to the ball and a lighter touch in her drop shots and lobs at these WTA Finals. The incentives are obvious. While Stephens won the Miami Open in March and is solidly entrenched in the top 10, at No. 6 , she also absorbed a few stinging blows in 2018. In the French Open final in June, Stephens was up a set but ultimately lost to Simona Halep. A few months later in the US Open final, Stephens, the defending champion, fell in the quarterfinals against No. 18 Anastasija Sevastova. But you can discount revenge and external pressure as motivators for Stephens this week in Singapore. It just isn't how her mind operates. Stephens has, somewhat unexpectedly, become more dangerous thanks to improved career management along with improved fitness and, yes, motivation. Stephens looks like she has found the post-Grand Slam season wind that eludes so many. Her late-season performances have historically been lackluster. This is her first appearance in the season-ending final, and she arrived in Singapore with the weakest record in the field (33 wins, just 2-4 after the US Open). Her coach, Kamau Murray, isn't even at the championships because of a long-standing com mitment to host the Clintons (yes, those Clintons) at his Chicago tennis academy. Undeterred, Stephens has won two high-quality matches thus far. She knocked off Naomi Osaka in three sets in her opener Monday and then fought off Kiki Bertens, who entered this event riding a nine-match winning streak against top-10 players, in a 2-hour, 20-minute match Wednesday. Their clash was a feast for fans of all-court tennis. Both women used every tactical ploy and shot in their armory. Stephens will qualify for the semifinals if she beats Angelique Kerber on Friday, although other scenarios also could see her through. "I'm so happy, so relieved," Stephens told the crowd in Singapore following her latest win. "It was a great match." Paul Annacone, a Tennis Channel analyst and former coach of Stephens' and others, including Roger Federer, told ESPN.com. "It used to be that when she lost a few matches she would get derailed for a whi le. Now she may go through some losing streaks, but it doesn't really crush her confidence. She can bounce back pretty quickly." Stephens likely will never be like most other players. She enjoyed early notoriety at age 19, when she reached the Australian Open semis. But she had trouble adjusting to the challenges that followed. Over time, she learned to cope with the pressure she put on herself -- as well as expectations of others -- a little differently than some of her peers. Mainly, she found ways to stare them down, an attitude that has baffled some critics. Stephens has refused to wring her hands over losses or alter her way of doing things in the wake of hitting a bad patch, even one as alarming as the eight-match losing streak that followed her breakthrough last year at the US Open. If that struck some as a "teachable moment," it could only be described as such in a curious way. Stephens' reaction to the losing streak had be en to double down, shrugging the losses off as the result of fatigue and distractions. Following her first-round Wimbledon loss at the hands of Donna Vekic in July, Stephens tweeted: "Trials make you stronger. As an athlete you have to recognize when to push ahead and not to dwell. I won't be dwelling." 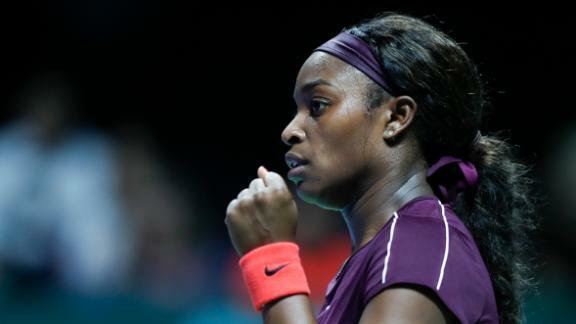 Sloane Stephens is 2-0 in the round-robin stage of the WTA Finals this season. In her coach, Murray, Stephens found a kindred spirit. They don't "dwell" or waste words or overcomplicate things. As Murray recently told the WTA, "Sloane is very easy because she's very honest. I want to eat this. Stop doing that. Can you get me this? I don't like this. I think this. He's serving this way. Tell me to serve this way. I think it makes it pretty easy." Annacone said he likes the way the pair work, especially on the rebound. They seem to put the past to bed and move on easily. "They circle back, fresh," he said. "It's just part and parcel of who she is, and maybe that's what we're seeing in Singapore." Two long matches must have had some level of a physical toll on Stephens. A round-robin followed by a single-elimination stage, all featuring only elite players, is a grueling challenge for a first-timer at the WTA Finals. But Stephens is playing like someone with a point to prove. "I don't think she's accepting mediocrity," Annacone said. "But she's realizing, 'I'm a great player -- I'm going to bounce back from losses and have some great wins, too. I'm not going to let any loss or group of losses cloud my mind.' That's what used to happen to her some years ago." Stephens has made a habit of punching through at some unexpected times and places. Singapore just might be next in line.